Congo Siasa: Countdown to 2016: How are elections shaping up in the Congo? Countdown to 2016: How are elections shaping up in the Congo? The United States is not the only country with a 20 month-long election campaign. Kinshasa is already abuzz with rumors, tensions, and street protests linked to the elections. The schedule is as follows: local and provincial elections in October 2015, senator and gubernatorial elections in January 2016, and national legislative and presidential elections in November 2016. If successful, these elections could produce the first genuinely democratic transfer of executive power in Congo's history, and the first comprehensive local elections. If the polls or rigged or the process appears illegitimate, however, it could set Congo's institutions back years and trigger violence. We can break the challenges to the process down into several topics: the voting register, outstanding legislation, electoral institutions, and funding. The voting register will be one of the most contentious issues of the electoral cycle. Currently, the election commission (CENI) is saying that it will not carry out a new voter registration before local and provincial elections (registration will instead happen between January and March next year). That means that––according to respective estimates by the opposition and civil society––between 5 and 8 million youths between the ages of 18 and 23 could be disenfranchised. Some opposition parties have already threatened to boycott the electoral process if this is not addressed. This lack of updating is far from the only problem with the register––the current register suffers from the legacy of the 2011 fiasco. The voter rolls in 2011 produced many suspicions that have never been resolved: registration growth rates in places favorable to Kabila were much higher than in opposition strongholds (compare 33% growth in Katanga and Maniema to the 13% growth in Kinshasa). One audit suggested that over 2 million duplicate registrations were in the system, although the CENI later said that these were real voters who happened to have the same first and last name; according to them, duplicate registrations stood at 119,000. The ensuing mess prompted the CENI to say on the day of the vote that anyone with a registration card could vote. Around 3.2 million (18%) ended up voting on the controversial "list of omitted voters/derogation voters," which opens the door for fraud. The opération de fiabilisation, undertaken earlier this year, was supposed to solve this problem. CENI called on citizens across the country to go and consult lists of voters posted at local election offices, so as to find out who had died, moved away, or was not present on the register but should have been. But, according to diplomats and civil society people who followed this process, turnout was extremely low. One source said that CENI had told him turnout in one neighborhood of Kinshasa was in the single digits. In part, this was because CENI had very little money to carry out a campaign, so few knew about the operation or understood its importance. So how bad is the register? We don't know, but given the controversies surrounding the 2011 vote, severe doubts will persist. In order to get an idea of what it was up against, CENI reportedly carried out a spot-check in one small part of the country. According to a diplomat close to the CENI, they found that a substantial part of the registry there was inaccurate––but it is difficult to know whether the same would be the case for the rest of the country. There is now supposed to be an external audit of the registry carried out by the Organisation internationale de la francophonie, but it is not clear to me––or several of the sources in Kinshasa who follow this closely––what exactly this audit will consist of. At the very least, they should try to see how many duplicates are in the database of voters. Civil society groups have asked the OIF to be included in this audit, but their request has not yet been answered. Following the acrimonious debate over the electoral law in January, there are few outstanding pieces of legislation required from parliament. The most important law on the calendar concerns the distribution of seats for local elections. The ministry of interior has drawn up a draft, which will now go to parliament, where it is bound to be contentious. For example, each groupement is supposed to be represented in the conseils de chefferie (chiefdom councils), but there are allegedly dozens of groupements (of the over 5,000 in the country) that exist only on paper. This debate over the groupement de fait and the groupement legaux could further delay the process. 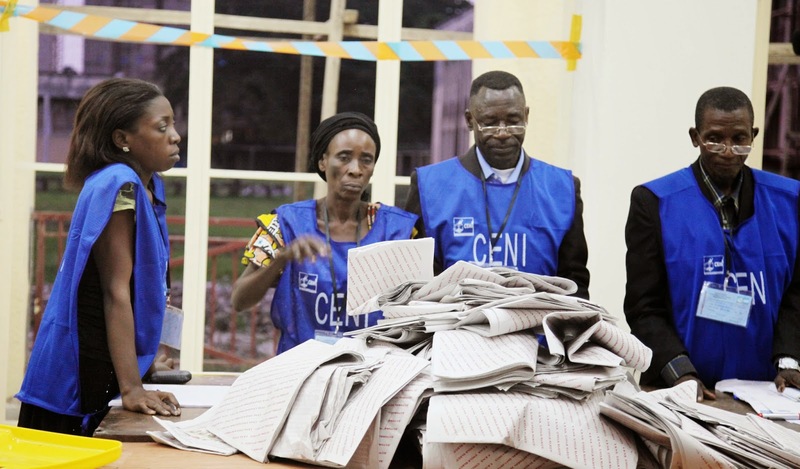 The most important electoral institution is the CENI itself. After the controversy of the 2011 elections, a new law on the CENI was passed to reform the institution. It separated the executive body from a plenary that is supposed to render the process more accountable. It also gave the leadership of the CENI to civil society, and continued to guarantee the representation of the opposition in the body. However, civil society is not a cohesive body and the wording of the law allowed for manipulation. Civil society was supposed to have three representatives––one from religious orders, one from women's organizations, and one from civic education groups. But none of these groups are structured institutions, and controversies ensued. The Catholic Church protested at what it perceived as a politicized process and withdrew its participation. The current head of the CENI, Apollinaire Malu Malu, a Catholic priest, ended up being designated by protestant churches and the small Muslim leadership. Even if Malu Malu had been a consensual candidate, nothing in the law says that religious orders should have the presidency of the institution. That choice, according to Sylvain Lumu, the head of Ligue des Électeurs, was imposed by the president of the national assembly, Aubin Minaku. "This was supposed to be a consensual process. In the end, parliamentary leadership just decided." And since Malu Malu is currently in poor health, the institution is being led by a member of the ruling coalition, André Mpungwe. Various other decisions made by CENI have been controversial, as well. For example, the designation of top administrative positions in the CENI is supposed to pass through an open, competitive process. This, according to civil society observers, was not the case. Malu Malu designated former colleagues such as Flavien Misoni and Corneille Nangaa––both extremely experienced in electoral management––to top jobs without following the correct procedure. Equally important, although rarely discussed in the media, are the other institutions that are supposed to support the electoral process. There are supposed to be 166 tribunaux de paix in the country to adjudicate electoral disputes for local and provincial elections. According to the International Bar Association, only 45 of these courts were functional in 2009. For the presidential election, the jurisdiction in charge is the newly named constitutional court. This body, too, has been criticized by civil society activists. The nine judges are supposed to be designated by the president, parliament, and the magistrates body (conseil supérieur de la magistrature, CSM). Since the CSM has been politicized, all three of these bodies have a political bias––unsurprisingly, many of the nine members of the court have occupied political posts in the past. Finally, the Conseil supérieur de l'audiovisuelle et de la communication (CSAC), the media oversight body, suffers from similar problems as the CENI and the constitutional court. It is supposed to make sure that media do not broadcast inflammatory speech, and that all parties have equal access to state media during election campaigns. But its members are supposed to be designated by journalists' associations, which in the past have been susceptible to political influence. The head of the commission, Jean-Bosco Bahala, was replaced last year––he had been seen as very favorable to the government––and the new president Tito Ndombi is less well-known. The budget for the entire electoral cycle is $1,145 billion. That's a lot of money for a government that has a real budget of around $6 billion (it's official budget is $9 billion, but execution is very poor) that is also planning on carrying out a national census and creating 26 provinces out of the current 11. However, diplomats and government officials concur that the government has been setting aside funds for the past several years to a "special account" in the Central Bank. One member of the parliamentary oversight committee said there might be up to $400 million available for elections in this account. If this is true, the money is not being disbursed quickly enough. According to the same sources, CENI's budget for the first quarter of the year was $45 million, but it only received $5 million. This is one of the reasons that there was no media campaign for the fiabilisation of the voter register. Foreign donors have been reluctant to step in to support a process that is so contentious. The European Union has said it will provide modest funding of national elections, but not of local ones. The UN mission thinks it might be able to provide logistical support to around 30% of hubs in the eastern Congo, where it has mostly of its assets. So will local elections happen? Despite all of these problems, if Kabila insists on holding local elections before national ones, as currently planned, it will be difficult to stop. The government is likely to find enough funding to pull off the polls. The advantages could be considerable: the only parties with enough money to field candidates and campaign across the country are members of the ruling coalition––a situation that will be accentuated if the opposition boycotts the elections. If Kabila's allies win big at the local level, they will control the local administration, which will give them a head start in the national parliamentary and presidential elections. Could there by delays and unrest caused by the process? Yes, but since the current strategy of the government appears to be glissement––deferring elections through repeated delays to gain time––that may be part of the point. MONUSCO's military mandate: A red herring?